Midfielder Kurt Lentjies hopes to help inspire Maritzburg United to victory over Ajax Cape Town at the Harry Gwala Stadium tonight. The match is the second last home game of the season for the Team of Choice, who following the Ajax game, take on Moroka Swallows (away), Orlando Pirates (home) and AmaZulu (away). The Urban Warriors are in good form in both league and cup at present and are set to provide a formidable challenge. “It’s going to be a tough game because Ajax just qualified for the Nedbank Cup final and their spirits will be high,” said the Cape Town-born Lentjies. “But our spirits are also high, we’ve just come off a positive result away to Bloem Celtic and now we must take maximum points at home against Ajax. “We have four games to go and at this time of the season all of them will be tough. But in terms of the top eight challenge, the ball is in our court – we are the one’s occupying that position at the moment. So we need to make sure that we drop as few points as possible between now and the end of the season,” he explained. Lentjies was on target in the 1-0 win over Celtic, but says it’s not about personal accolades right now, but rather about the team’s objectives. “I doesn’t matter who scored the goals, as long as we get the results. I just try to do my best for the team in every game, and hopefully I can help us to get a top eight finish, which would a brilliant achievement and the first time in the club’s history,” he said. 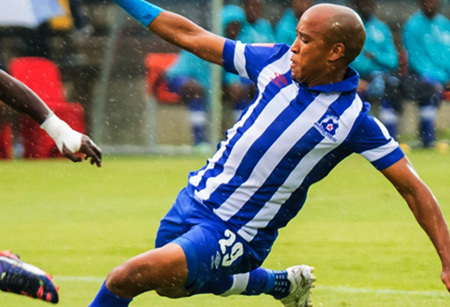 Midfielder Kurt Lentjies hopes to help inspire Maritzburg United to victory over Ajax Cape Town at the Harry Gwala Stadium tonight..